Custom Donations were one of the first features we ever built on Givebutter, and they've been a staple of our campaign pages ever since. Conventional wisdom says donation forms should be as quick as possible—no frills. We're all about simplicity, but not at the cost of providing you and your donors with the beautiful giving experience they deserve. 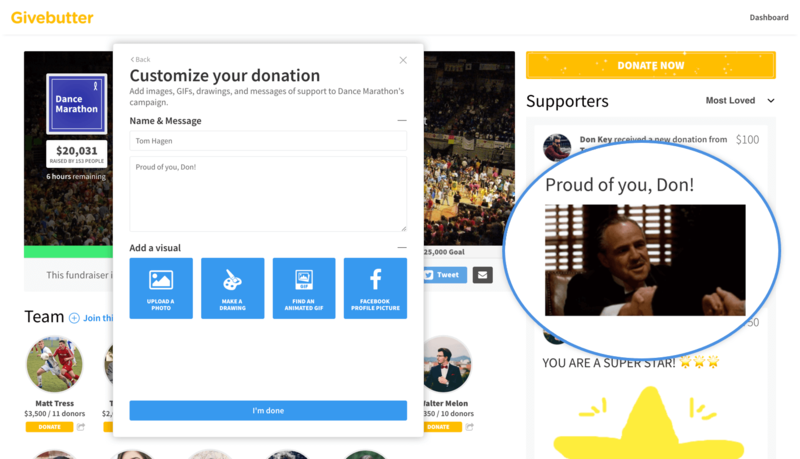 In fact, we frequently hear that Custom Donations are our users' favorite part of Givebutter, and that seeing the flood of images, GIFs, messages, etc. come in was a totally unexpected bonus, which encouraged more sharing and community buy-in as a result. For a walkthrough on Custom Donations, check out this FAQ article. If you'd like to try out Custom Donations yourself, please feel free to visit this demo campaign and make a test donation. How can I customize my donation?